When I was in Primary 6, a classmate gave me a baby Tiger Oscar for my birthday present. 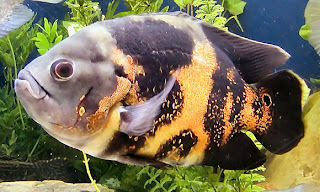 This dark gray-with-bright orangey-"splashes"-all-over-its-body-fish was such a cutie! It stayed with me for... err... I forgot how long. From the size of my thumb, it grew up to the size of the palm of my hand. Sadly, it died one day because the oxygen supply was cut off accidentally while I was away for a one-week holiday with my family members. Since then, whenever I got chance to visit fish shops, I'll look for baby Tiger Oscars. I still like the darker colored ones, not the albino type. Look at this gorgeous fish! It's also known as the water-dog. Great site with lotsa helpful info!